The night sky had been full of stars, almost mocking the forecasted weather front that was said to be coming to the area. By morning the western sky was overcast and it was clear that something was afoot with a chill in the air and a strong wind. We would have to bundle up at times, get some light drizzle and a dusting of snow before we were done, but nothing terribly threatening. Odd weather for June in the Nevada desert, though, a welcome change from the more usual heat. Three of us were here to climb Cleaver Peak, a P2K and the highpoint of the Desert Mountains, a medium-sized range separating the Carson and Walker River drainages. We'd camped at the base of the range on the south side off Julian Lane. Our route would closely follow that of Dennis Poulin's posted on PB, only in reverse. We drove in Sean's Jeep up to the end of the rough road at 5,300ft, then started hiking up the ravine heading northeast. Near its end where it flattens out we climbed onto the slopes to the left and headed up to the bonus Peak 6,650ft, about 2/3mi northwest of Cleaver Peak. As one climbs onto the broad summit ridgeline leading to the bonus peak, an old jeep road is encountered and can be followed for about half a mile towards the summit. This road is accessible from US95A to the west and may be drivable in a high-clearance vehicle. We knew about its existence beforehand but had no beta on the road conditions, leading us to choose the more conservative option. It took us just over an hour to reach the unassuming Peak 6,650ft where we paused only briefly. With better conditions, there are good views of the Carson River and Churchill Valley to the north By now it was fully overcast and hazy, muting the views. We had to drop about 400ft to the saddle between the two peaks before climbing to the summit of Cleaver Peak, an effort that would take about 45min. The footing was decent but there was quite a bit of volcanic rock strewn about the slopes, making for slower progress than otherwise. Asaka in particular was having a tougher time with it, her back hurting her still from a slip she had taken the prior day during our decent from Mt. Como. We found a register notepad left by Gordon and Barbara in 1996 with a few earlier entries on business cards from the 1980s. The peak is fairly popular given its P2K status, with 17 pages of entries in 20yrs. With the uncertainty of the weather (and me without any raingear in my daypack) we didn't stay long. Our return bypassed the bonus peak at the expense of some not-so-bad sidehilling that we followed to the southwest once we had descended to the saddle between the two peaks. We passed by a wildlife guzzler on the way back that used a corrugated roof to collect water and store it in a plastic tank underneath. Oddly, there seemed no way for the wildlife to actually access the water. Other setups I've seen have a float-actuated valve to supply water to a smaller drinking trough connected to the storage tank. Perhaps they never finished installing this one? We were back around 11:15a, the 5mi outing taking us nearly 4hrs to complete. Asaka's back wasn't getting any better so the two of them decided to end the day with this outing and start back for the Bay Area. After driving back to where the van was parked we bid goodbye, they heading north to I-80 while I headed south, back towards Yerington. I had some other summits in the Singatse Range I was interested and wasted little time in getting to them. The Singatse Range separates Smith Valley to the west from Mason Valley to the east, the West Walker River flowing through both. The hills here aren't very high and present a dull brown most of the year. There are three summits with more than 900ft of prominence and I was after two of those this afternoon. The first of these is in the north part of the range. Though fairly far from the highway, partially paved Campbell Lane runs west from US95A through the range to the Minnesota Mine. Another road, not as good but still serviceable to low clearance vehicles, runs northwest from a junction just before the mine. I drove until I met another junction with a powerline road where I parked. A high-clearance vehicle can drive another mile towards the peak heading east, but it didn't make much of a difference since I was less than two miles from the summit at this point. I hiked the powerline road past the more interesting Peak 5,900ft, a bonus I would tag on the return, making my way over easy terrain even after leaving the road. It took just under an hour to find my way to the top of the summit where I found a rather large cairn but no register. From the summit, I descended west on the ridgeline connecting the two peaks, another half hour's distance. Peak 5,900ft is a bit castellated on three sides but the east side I ascended is tame, though steep. After taking a few pictures, I scrambled down the south side of the summit rocks a short ways (the only real scrambling today, even if short), at the end of which I turned southwest and made a beeline for the van about a mile away. The outing took a little less than two hours. On my way back out to Mason Valley on Campbell Lane, I stopped near Gallagher Pass to pay a quick visit to this bonus peak only a quarter mile from the road. Although steep, it took only eleven minutes to climb to the summit and something less than that for the return. Yay. Back on US95A, I drove south for a dozen miles to the southern end of the range where Mt. Wilson rises as the range highpoint with more than 1,500ft of prominence. Like most of the summits in the range, it can be climbed from just about any direction. I chose to climb it via the East Ridge, about 2mi one way. Parking off the highway is not so easy here, but I found a small turnout just north of the ridge that would do. A fenceline runs the length of the highway to keep large wildlife from wandering onto the roadway and it was necessary to surmount this before starting up the ridge. The weather started to improve some as I headed up around 4p, adding some blue color to the otherwise dull skyline. Combined with the late afternoon lighting and the green farms in Mason Valley, it made for a picturesque scene for this moderate hike. 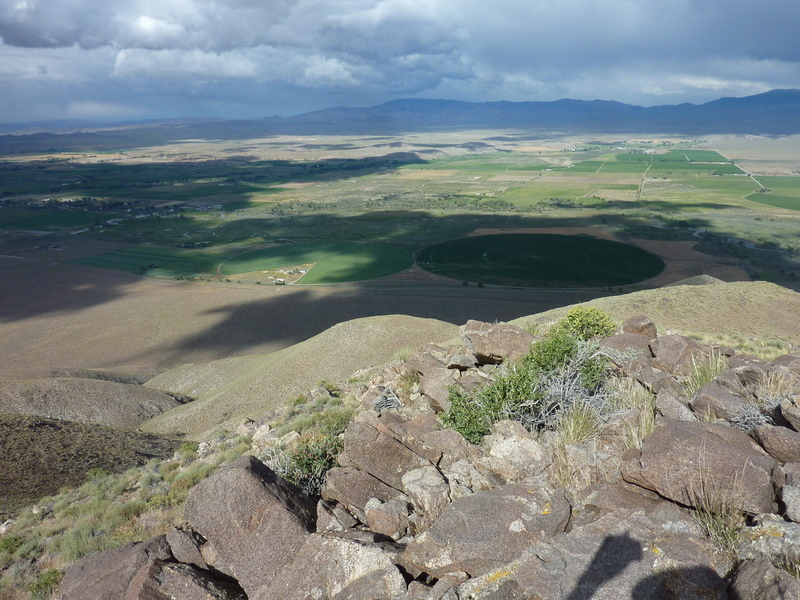 The highpoint is found about 1/3mi southwest of the crest once a false summit is reached. Wooden survey stakes have been refashioned into a rough cross in a medium-sized summit cairn adorning the top, overlooking Smith Valley. A MacLeod/Lilley register from 1996 had 19 pages of entries, easily the most popular peak I'd visited on this trip. Had it been earlier in the day, I would have made a larger loop by continuing to Black Mtn about 2.5mi to the north. It was 5:15p by this time and I would probably have enough daylight but I was feeling well short on energy. Time to head down.